Sonata Arctica, a Finnish power metal favorite, decided to do a local tour before the release of their upcoming album, Pariah’s Child. 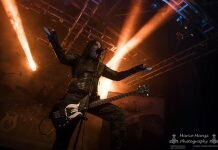 This tour included several dates in several locations throughout their native country, including one at Tampere-talo on January 30th, 2014. Tampere-talo is not a regular metal-style music venue. It is a mid-sized seated venue, more suited to classical music, orchestras, and live theater. An interesting choice for a venue, it holds more seating space than the usual first-choice metal venue in Tampere, Pakkahuone, and ensures that just about everyone can see the stage at all times. On the other hand, it’s hard to let loose and enjoy yourself when you’re seated at a metal gig. It almost gives a viewer the sensation that they should be expecting an intermission at some point as well. The intro track began playing a bit late and the band started their gig off with some unreleased material, a song called “The Wolves Die Young” from their upcoming album. Tony Kakko (vocals) had promised in an interview that there would be a lot of wolves in Pariah’s Child, and this first track is true to his word. It had a rather Christmasy-sounding introduction, but also bears a bit of throw-back sound to their earlier material. Speaking of earlier material, they played quite a few songs from their first two albums during this show. A common favorite amongst old fans, “Black Sheep,” was played around five songs into the show. Tony changed some of the lyrics from, “lowbrow children, in grove of the inland” (if I recall correctly) to, “we are Sonata and we are from Finland!” Alongside this, they also played “FullMoon,” “Kingdom for a Heart,” and “Replica” – the latter two of which I’ve never heard live before, so it was a real treat to hear them, even if “Kingdom for a Heart” was shortened and played directly into “Wolf & Raven” (a song that some fans never expected to hear live again on the basis of claims that Tony doesn’t like it). “FullMoon” had an interesting rhythmic gallop going on, sounding a bit like Iron Maiden. “Kingdom for a Heart,” on the other hand, while cool to hear, was a tad awkward live due to the overlapping vocals in the chorus, which had to be skipped since there is, of course, only one singer. From their newest album, Stones Grow Her Name, they only played one song (pre-encore): “I Have a Right.” The song has a very nice message to it, but musically there isn’t really much to it, even live, which makes it honestly kind of a drag to hear. The Days of Grays got a bit more attention when they played “Flag in the Ground” and “In the Dark,” a bonus track that I for one never expected to hear live, which was beautiful. “Flag in the Ground” really is a great song, but of everything played that night, it did the most to show Tony’s well-known English troubles, with his pronunciation of “th”-sounds in most words sounding like “everyting,” for example. However, it is a minor thing of note since the song was otherwise awesome. Tony looked different from the gigs we’ve been seeing him in over the years. For one, he’s rockin’ a bit shorter of a hairdo these days, reminding me of Skunkworks-era Bruce Dickinson, right after he cut his hair off. He had also abandoned his Canadian snowboarder look (plaid shirts, plaid shirts, and more plaid shirts) for a somewhat more metal look, with dark metal-style pants, cuffs, and a t-shirt. He wasn’t quite so bouncy on stage either, somehow managing to lose a hint of fun and replace it with a touch of cool. 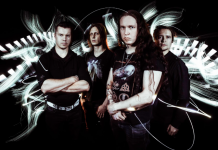 Back in August 2013, the band announced that their previous bass player, Marko Paasikoski, had decided to call it quits because he no longer had the passion to be in a band and had to move on to other things in his life. Pasi Kauppinen replaced him immediately, a fellow who has already recorded parts of their albums with them before, and has mixed their DVDs as well. It was clear that they knew him well and it was an easy fit for him to come in. He performed nicely with the others and they had good stage chemistry together. Elias Viljanen (guitars) seemed to have his own personal fanclub sitting in the row beside the mixing booth. Amongst this group of five or so people was a lovely woman with two young children. The elder (girl) was waving enthusiastically at him for a lot of the show, and he was waving back, so there was speculation that this may have been his family, cheering him on. The stage itself was awfully big. As mentioned previously, it’s more suited for live theater or orchestras, which need the room. In this case, it’s hard for a band of five to fill all of that space, even if they do walk around, which Sonata didn’t, really. Tony did his fair share of wandering about, rocking out with his mic stand as always, and making sure each side of the venue got some love. However, Henrik Klingenberg always stays close to his stationary keyboard and didn’t venture down from the platform to engage with the others very often. Likewise, on very few occasions did Pasi and Elias change places. While they do their utmost to perform the music nicely, they weren’t much for bouncing around stage on this night. Even Tony himself wasn’t as hyped up as he has been in the past. Though the venue had insisted that the show would be over at 20:15, Tony had assured us that they couldn’t be chased away so easily. During the last parts of the show, songs like “Victoria’s Secret” started to finally encourage the crowd to stand up. Though most people sat down again after that song, it did encourage the crowd to stand up through the entire encore, which consisted of “Cinderbox” (the only other song from their new album), “The Cage,” and “Don’t Say a Word,” before their traditional end to the Finnish shows: the “Vodka” outro. While I’ve seen Sonata Arctica on many, many occasions, very few of those have been in venues; the majority having all been at festivals. Their festival performance is always energetic and possibly fueled by some level of alcohol. However, the last show I attended at the Virgin Oil Co. in Helsinki was, to say the least, underwhelming. They performed like they were being forced to do the show because they had lost a bet. This show at Tampere-talo redeemed them completely, and proved that they still have the passion and the skill to play a clean and energetic show! Their live song selection is never certain, and you are always sure to get an interesting performance out of them.